This is why you don't want to take the Atoner for granite. Once, there was a major villain named Bob. He committed every crime one could think of, and he did it with a song in his heart and a skip in his step. Then, something happened to make him ''see'' the horror of what he was doing. He realized how much pain he had caused, and he set out on a personal quest to try to make it right. The Atoner is an evil character who has realized the error of his ways, possibly wants to make amends, and has decided that they will do so via heroic deeds. Simple imprisonment won't do, because it does nothing to make recompense for what he's done wrong. Besides, he still has all these amazing skills and resources from the Bad Old Days—wouldn't it be better to use them for good? The problem is, Bob often has to wrestle with the temptation to return to his old ways, along with the massive guilt built up over years of carefree evil. Also, said previous villain skills usually involve killing people in very messy ways, which can result in karmically harmful situations. Other times Bob's evil side won't go down without a fight, and manifests itself as an Enemy Within. Ultimately, it comes down to the fact that morality isn't a book that can be balanced—no amount of babies saved now will bring Bob's past victims back to life. The Atoner usually realizes that "Redemption is the path, not the destination" and continues for the rest of his life. Sometimes 'the rest of his life' is short because Redemption Equals Death. Generally the only Atoners who avoid this are main characters who are already in the atoning stage by the series' start. Atoners often end up as Knights in Sour Armor. Those who believe redemption inherently equals death may well become Death Seekers. A subtrope of this is "Assassin Wants To Quit." Stories involving them allow us to cheer on the assassin as they battle their former employers using the same murderous skills they honed during their previous career. Atoners sometimes go on a Redemption Quest in order to atone. If their deed of atonement is especially painful, it may overlap with The Penance. Would-be Atoners who are not sincere are trying to Buy Them Off. Not to be confused with The Aloner, though they can both coincide if the character is trying to atone for killing off everyone else on the planet. And especially not to be confused with The Stoner (unless they turned to drugs to cope with their guilt). The Atoner may face rejection and hatred from those who don't believe he's reformed, which is Reformed, but Rejected, and more importantly, he must be careful not to run into the HeelFace Door-Slam. In some instances, however, there are characters who will acknowledge The Atoner's change of heart, but do so in a grudging manner. The Atoner must also beware of one character who actively seeks to end his path to redemption. The success rate of atoners depends on where the work sits on the Sliding Scale of Idealism vs. Cynicism. In more idealistic works, or at least ones that posit that people can change for the better, atoners may have a greater chance of success, as proof that no matter one's actions may have been in the past, it's always possible to change for the better and do good. Genuine atoners have a high chance of becoming The Woobie, especially if they were an Anti-Villain in the first place. See also, Be All My Sins Remembered, where they continue to suffer a guilt complex over their past misdeeds. Contrast with My Greatest Failure—instead of a formerly evil character turning from their past, a good character feels the need to atone for not preventing a bad outcome (regardless of whether they could have changed anything). The Atoner may have experienced Go and Sin No More. "The Man Who Would be King" (named, but not based by book-movie) by Iron Maiden. "The Noose" by A Perfect Circle. "Working My Way Back To You" by The Four Seasons, about an abusive ex-boyfriend who sees the error of his ways too late and is now trying to win the girl back, unsuccessfully to date. The song "Cat's in the Cradle" by Harry Chapin focuses on a father who is far too busy with his work to connect with his son. By the time the father has the time (i.e. the son has grown up), he tries to reach out to his son and atone, but by then, his son is, like his father, far too busy. "I'll Be Good" by Jaymes Young is about a man who wishes to atone for his bad behavior in the past. Heracles in Greek Mythology did this a lot. Because he didn't know his own strength, he was always accidentally killing or severely maiming people. At one point this got so bad that the citizens of Athens refused to accept him into the city until his buddy/cousin Theseus vouched for him. Hercules, however, kept trying to convince his friend that the citizens were right. In fact his famous twelve labors were atonement for when he killed his wife and children (though to be fair it was because Hera cursed him with temporary insanity). Another time he was forced to work as a man-servant for a woman for several years. While wearing a dress. In The Gamer's Alliance, Omaroch becomes this after he breaks free from the dark god Mardük's control. He sees it as his fault that his sons ended up on a dark path, and he was partially responsible for the birth of the Godslayer who shattered the world's continents. He wants to atone for his past actions and hopes to be able to set things right again even if it means sacrificing himself to achieve that goal. Sinestro is this in the World of Heroes roleplay, with interesting consequences. Amanda Remous used to be a ruthless assassin and mercenary who was nearly borderline terrorist. After reuniting with her brother, she began to regret the things she did and joined Dino Attack Team, striving to redeem herself of the crimes she committed. General George Ogel used to be the ruthless general to Evil Ogel's Skeleton Done armies. However, when he reunited with Talia Kaahs, he had a Heel Realization and decided to make it his goal to redeem himself. George Brown was a young man who got caught in the wrong side of the realist-idealist feud, and later provided information on Cam O'Cozy and volunteered for a campaign in the hopes of redeeming himself. Blaire Darkling tried to do this, leaving behind his life as the dangerous criminal Matthew Vherestorm and tried to redeem himself by working for Paradox, an organization devoted to researching the Maelstrom to help Nexus Force defeat it. Unfortunately, it didn't quite work out, as this ultimately landed him in another organization, XERRD, which went on to create the Dino Attack apocalypse. In the Campus Life RPG, Mewtwo is revealed to have abandoned the family of cloned Pokemon he created when threatened by Team Rocket. He now spends time developing inventions to improve the lives of people in third-world countries, and has a bad case of Chronic Hero Syndrome. Antonio Banks turned Montel Vontavious Porter. His wrestling career is atonement, as he was arranged to enter the sport by his corrections officer in an attempt to keep him from going back to prison. It worked, and while it's still real, this element of his on set persona virtually disappeared when he was hired by WWE, up until the Miz decided to mock him for it out of the blue. Up until then the most he ever got accused of being was "New Money." ODB and Jacqueline, in their quest to get their TNA contracts back, though ODB was always a face in TNA, even when she wasn't supposed to be. They were contrasted by Traci Brooks, who said they should just accept TNA has moved on and wasn't going to use them, like she had. Money hungry Steve Corino and railroad spike wielding fiend Jimmy Jacobs willingly spent 2011 trying to atone for their sins and strove to be good from now on. Then Kevin Steen had to come and ruin it. Jeff Hardy was this in late 2011 in TNA. After being completely stoned off his guard in the Victory Road 2011 main event a few months earlier, he came back to apologize to the fans and was asking for forgiveness from the other wrestlers for this. His road to redemption was completed as he defeats Austin Aries for the TNA World Heavyweight Championship in Bound For Glory 2012. Arkham Horror's "Dunwich Horror" expansion adds Diana Stanley as a playable character. She joined the city's exclusive Silver Twilight Lodge and learned to her horror that they plan to awaken an Eldritch Abomination into the world. Diana is now the mole in the cult planning on thwarting them—granting her bonuses the closer they get to succeeding. Every player character in Demon: The Fallen is a demon, one of those who fought against God and the angels in the War of Wrath. In modern times, there's a faction called the Reconcilers, who have asked themselves, "What if we really were the bad guys?" They work to either undo their sins and return to Heaven, or, if that's impossible, to at least fix the damage they did to the world all those years ago. The Dungeons & Dragons sourcebook Fiendish Codex II introduces the Hellbred, former evildoers who repented of their actions before they were condemned to Hell, but too late to gain entry to the heavens. The good deities reincarnate them into fiendish-looking bodies to give them one last chance to prove their search for redemption is genuine, and since only the greatest of heroic deeds will free their souls from damnation, the Hellbred throw themselves into their quests with zeal and desperation. The Loyalists of Thule in Hunter: The Vigil have an Ancient Conspiracy-wide Guilt Complex, and it rubs off on its members. Why? Oh, nothing, they just helped the Nazis in World War II and they largely believe themselves responsible for the Holocaust as a result. Yeah, they have issues. One of the two main paths for Abyssal Exalted is to become this, make up for their dark deeds in the service of the Void and work their asses off to avoid spontaneously combusting from Resonance. If they can pull it off, they become Solars, without the Great Curse that messed up so very much of the First Age. The potential impact of this remains to be seen. This is the background of Magic: The Gathering Legends card Pavel Maliki . There's a similar effect with Repentant Vampire . The Apok class from the Wormwood setting from Palladium Books centers on people who were thoroughly evil who nevertheless realized the depths of their evil and due to that devotion to atoning for their past evil (and immersion in a Lifeforce Cauldron) they become transformed into powerful agents of good who're 100% devoted to good and cannot be corrupted by any means and are immune to the most horrific of sights and corrupting influences due to their unbreakable devotion to good. Here's a canonical tale from Pathfinder: Some years before the setting's current time, a fourteen-year-old Street Urchin named Seelah stole a paladin's helm, intending to pawn it for food money. Later, the paladin died of a blow to the head. Seelah, consumed with guilt, returned the helm with the intent to commit suicide on the paladin's funeral pyre. Instead, she was taken in by the order and became the iconic paladin. The Wrath of the Righteous Adventure Path features a succubus called Arueshalae who decided to peek in a dying priestess of Desna's dreams and got caught red-handed by Desna, who decided to give her a chance and awakened her soul, and ever since she's been struggling to change her nature to become a force of good - her first action was to save a child that found themselves in the Worldwound, and which might eventually become one of the AP's heroes. When the PCs find her, Arueshalae is a few tasks away from full redemption. The Asilos of The Splinter are an entire race of atoners. They're incapable of letting go of their past and are primarily driven by the desire to repent for their sins by doing good. Some Dwarfs in Warhammer may find themselves unable to fulfill an oath, and so to assuage their honor join the Slayer cult, dyeing their hair red, eschewing armor, grabbing an axe, and throwing themselves at the worst monster they can find to either kill it or be killed by it. (Un)successful ones may graduate from Troll Slayers to become Giant Slayers, Dragon Slayer, or even Daemon Slayers. The Dark Angels are a Space Marines chapter that refers to themselves as the Unforgiven, because during the Horus Heresy a portion of their force turned traitor out of pride or confusion. This being 40k, their method of atonement is to hunt down these Fallen Angels and "redeem" them by torturing them to death, and it's hinted that perhaps the original Dark Angels were traitors themselves who were sitting out the Horus Heresy until a winner emerged. Cypher, one of the Fallen, seems to be seeking redemption and may or may not be the key to the salvation of the Dark Angels, if not the Imperium as a whole. Naturally, the Dark Angels are intent on putting him down. Inquisitors can add Penitent Witches to their retinues, as psychic lightning rods that can absorb psychic attacks that would otherwise hit the Inquisitor. The Sisters of Battle field units of Sisters Repentia, who have decided to atone for some real or imagined failure by stripping down to a few strategic scraps of prayer-inscribed parchment, grabbing a two-handed chainsword, and charging at the enemy. The planet Krieg went through a rebellion that resulted in five hundred years of civil war and the self-inflicted atomic cleansing of its surface. To atone for this lapse in loyalty, the Death Korps of Krieg now commits to the bloodiest sieges and most horrific meat grinders in the galaxy. The ancient Eldar empire became so decadent and depraved that it created the Chaos God Slaanesh, so the Craftworld Eldar who survived it live extremely regiment and spartan lives to avoid the mistakes of the past. The Dark Eldar for the most part continue the old traditions, but some will have a Heel Realization and leave Comorragh for new lives among Exodite societies, Harlequin troupes, or simply as hermits, mercenaries and corsairs. Which may not sound like much, but considering what kind of stuff the Dark Eldar do, it's a really big improvement. The tale of Gagagigo, one of the very few instances of continuity within the Yu-Gi-Oh! card game, shows the tale of a lizard warrior who once hungered for power, and, after the Marauding Captain takes an attack for him, becomes this. Unfortunately, he would ultimately lose his morality after becoming a cyborg. In Pokémon Live!, Delia tries to be this to protect Ash from knowing her troubled past with Team Rocket. In BIONICLE, Brutaka is treated as one: sent to the highest security prison in this verse, sent to a suicide mission as probation, then welcomed back in the Hero Secret Service. The big surprise is that his best friend Axonn, who had to stop him when he betrayed, is another, according to the Atlas. In the second Fragment's Note, this is what inspires Yukitsuki to go into psychology and to a lesser extent help Kyoichi with his own psychological problems. In Hatoful Boyfriend Sakazaki Yuuya is midway between this point and My Greatest Failure. When he was very young someone killed his father to marry his mother, and would have killed his unhatched brother. Yuuya hung on to it and switched it with his new half-brother's egg so his brother would survive, then smashed the new egg. This action weighs heavily on him years later and is something he's unable to ever forget, though he's fully accepted it and what it means, and so he tries endlessly to do good and save people. Mamiya Shinzo in Kara no Shoujo. He went insane and turned his lover int a model for a fresco by cutting off all her limbs and putting her into a large black egg. When he regained his sanity, he absolutely repented and felt the fresco was a horrible horrible thing, but by then it was too late and worse, there was no real way to atone for it. In Kiss of Revenge, Issei Sezaki is haunted by a mistake he made during a during a routine operation which led to the death of his patient. He's spent the more than ten years since the incident devoting himself to the patients of his hospital and doing everything humanly possible to give them and their families the best of care; the nurses are used to seeing him pulling all-night research sessions when not on call, and he keeps a notebook filled with the details of every patient he fails to save, keeping the guilt fresh. When confronted by the daughter of the patient he accidentally killed, he takes it even further, making a public confession of the mistake and deciding to quit medicine entirely, and going so far as to offer to kill himself if that's what it will take to make amends. Little Busters! : Mio holds a huge guilt complex for forgetting Midori, her imaginary friend turned real from childhood, after her parents sent her to therapy and gave her medication. Her route even involves her giving up her entire existence so that Midori can live instead of her. It's even sadder in that in the real world, Midori doesn't actually exist—she only appears in the game because that's part of the world Mio had the boys create. This is a running theme in the Parascientific Escape series. The villain of each game realizes their evil and attempts to make up for it. In fact, the villains of the first two games turn themselves in to jail and do go on trial! Misaki, villain of the first game, is found Not Guilty due to coercion and is allowed to go free. Tsukiko, villain of the second, is guilty but is eventually allowed to live under house arrest on the grounds she serves as a spy for Yukiya. Yuuyi has quite a few things that haunts him from his past, and it's obvious he has done things he regrets to this day. Throughout the novell he wonders numerous times whether he even deserves a peaceful life, let alone happiness. Amane feels this especially towards Yuuji. She has this in general, living with survivors guilt as the sole survivor of a terrible accident. However when the same person's brother shows up in her school, whom she was force to leave behind, that feeling quadruples. Yumiko's father Michiaki becomes this after being defeated, wondering where his life went utterly wrong and realising that he can no longer feel empathy for the people he hurt. Deconstructed with Valerian Trifa from Dies Irae. Back when he was just a kindly priest, he attempted to run away from the madness of the Longinus Dreizehn Orden alongside the orphan children he cared for. Unfortunately, Reinhard found him and as punishment forced Trifa to pick ten of the children to be executed right in front of him. This lead to him blaming himself for their deaths due to being weak and unable to protect them in the face of adversity and vows to make amends. 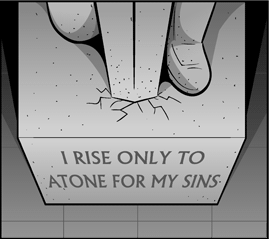 This vow however becomes an obsession and ends up making him blind to just how wicked he has become by the start of the story and to how flawed and nonsensical his idea of atonement really is.